According to the Paylab international salary portal, which has monitored trends in employee salaries at the level of individual positions over the long-term, men receive on average 9 per cent more than women in the same position. The gender gap has greater testimonial value within salary analysis through the optics of the same position, because such salary comparison is based on an identical workload and approximately the same prerequisites, such as experience, education, and skills. The salary gap in favour of men is most often the result of women putting their careers on hold when they have children. The need to balance their family and work obligations often force women to take on work that is less demanding in terms of their time. They also tend to aspire less towards management positions compared to men. Companies are currently engaged in efforts to support greater diversity in the workplace and to create working conditions for women to ensure they have equal opportunities and greater motivation to return back to work as soon as possible from their maternity leave. Another factor for the gender gap is that women tend to focus on lower paying positions. The choice of occupation has a major impact on the overall remuneration of women. For instance, women predominate in industries including administration, accounting, healthcare and social care, HR, education and pharmaceuticals. Men are in the majority in the best paying industries, including IT, management, transport and logistics, construction, energy, telecommunications, industry and technology. Industries with a more balanced ratio of men and women include trade, arts and culture, banking, marketing, tourism and services. Work gives women the opportunity for greater financial independence from men. Gradually, the perception of women has changed in society with respect to their professional aspirations and the overall freedom of choice in their personal lives. Millennials currently have many more job opportunities and career prospects than past generations. Thanks to their work experience, they also have greater self-confidence and ambition. Support for diversity in the workplace, with greater emphasis on a diverse workforce, is a contributing factor. Company support for diversity is an expression of a mature corporate culture, with the greatest benefits being the diversity of perspectives and approaches they bring to resolving work tasks. Women often face significant challenges when returning to work after a career pause. 37% of employees encounter colleagues who are also mothers to children under the age of 10 in the workplace. Employees most often work with them in customer support, the textile industry, state government and banking. This is a result of the international Paylab Diversity Study 2019. Mothers have the most positive perception among employees from all the monitored groups. Up to 32 per cent of respondents reported that they were pleased to have such a colleague at work. Only 2 per cent of people reported that their presence at the workplace was an actual impediment. Finland and Croatia have the most open approach to mothers in the workplace. Conversely, employees in Slovakia have the lowest level of acceptance towards mothers among the surveyed countries. Employees experience the lowest level of interaction with mothers at work in Slovakia and in the Czech Republic. Women's employment in the European Union (EU 28) is at a level of 66.5%. The number of women bringing home a work salary continues to increase from year to year. Women's employment in the European Union according to Eurostat data has risen by 6 per cent over the last decade. 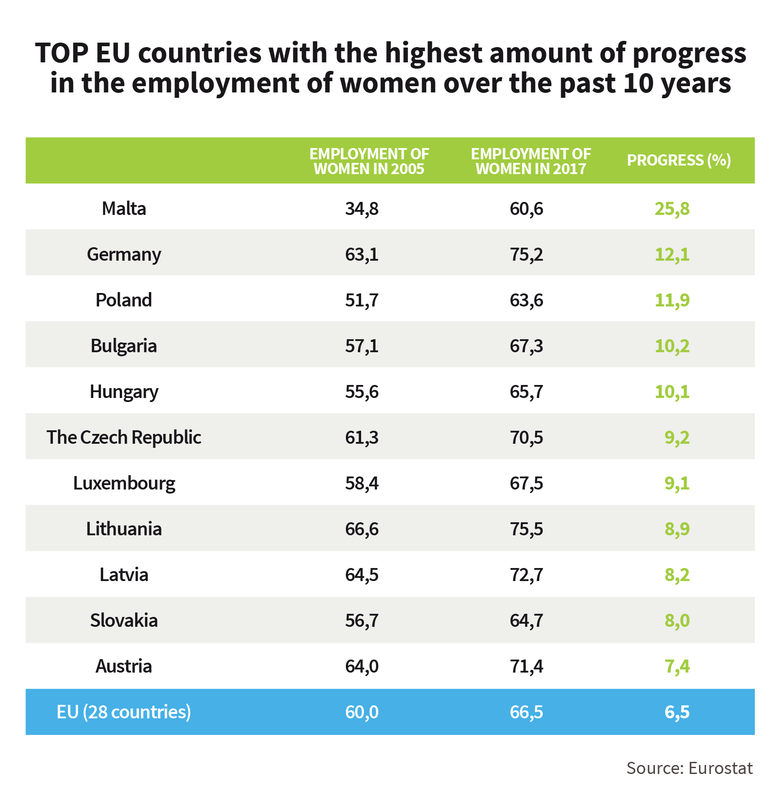 The greatest progress in employing women has been achieved by Malta, Germany, and new member states, including Poland, Bulgaria and Hungary, where women's employment has risen by 10 per cent over the past ten years. Men are 11.5 per cent more active in employment compared to women overall in the EU. The tradition of working women varies across the countries of Europe and depends on many factors. 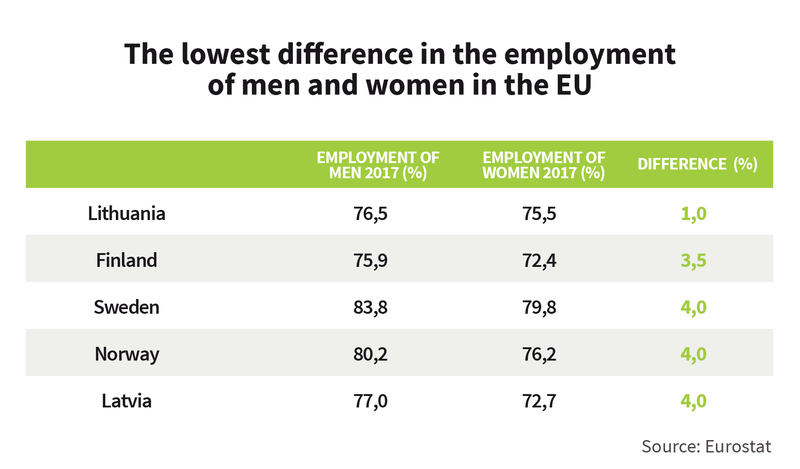 Countries where the employment of both genders is most balanced primarily include the Nordic countries such as Lithuania, Finland, Norway, Sweden and Latvia, where the difference in employment between men and women is less than 5 per cent. 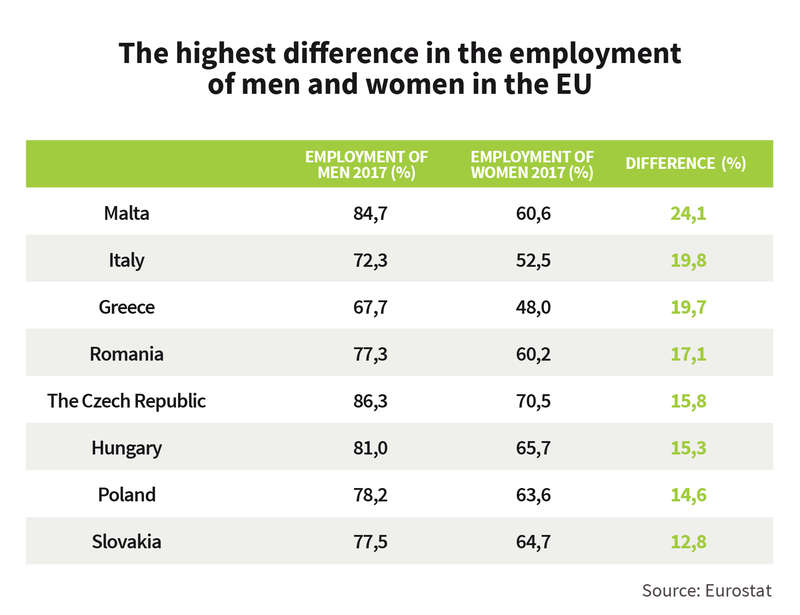 The countries where the differences in women's employment are the greatest include Malta, Italy, Greece, Romania and the countries of Central Europe, including the Czech Republic, Hungary, Poland and Slovakia. The range of available part-time jobs also increase the labour market participation of women, with such positions most available to women in the Netherlands, Austria and Germany. They also provide better opportunities to find a work-life balance. According to Paylab.com portal data, the most attractive non-financial benefits currently include time flexibility. A growing number of companies offer their employees flexible working hours, the ability to work from home and more days off. These non-financial benefits also encourage women to join the workforce.